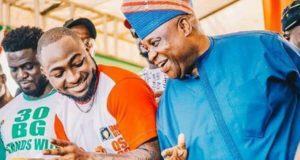 �It is this David Adeleke and Sophia Momodu soap opera”. �Well, I think the Momodus and the Adelekes should just spare us. �Ok. He is talking about Marijuana. When he was head over heels in love with the Momodu girl, he didn’t smell marijuana? I am sure if he was given Marijuana before he was allowed to inhale, he would willingly exhale?